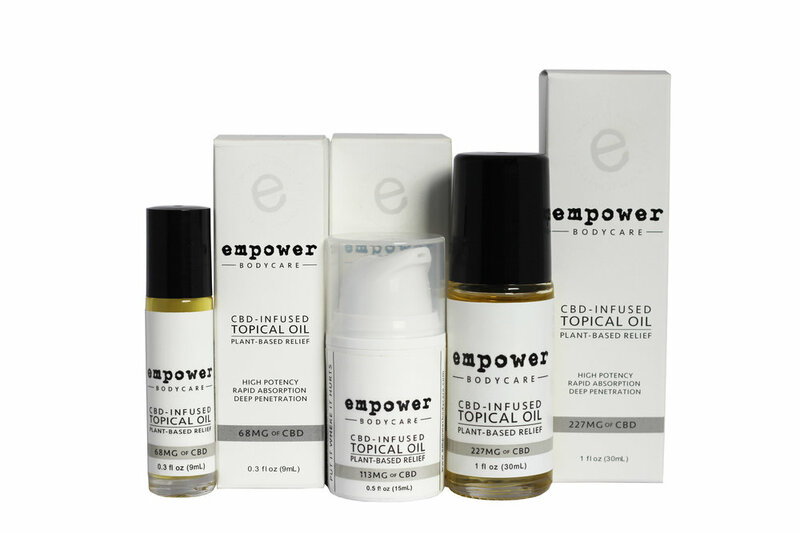 The synergistic combination of essential oils, non-GMO carrier oils, and organically grown hemp-derived CBD extract in Empower® Topical Relief Oil soothes discomfort*. Every batch is 3rd party lab-tested for superior quality and potency. Dispensing Type: Roll-On. This product can be conveniently carried and quickly and easily applied. Cannabinoid Sourcing: Hemp-infused products contain CBD derived from organically grown hemp. Testing: Every batch of our award-winning formulas is infused with THC-free CBD extract and is 3rd party lab-tested. Certificate of Analysis is found here. Hemp Derived Cannabinoid Content: 30mg** CBD per 4oz bag | 118mg** CBD per 16oz bag. Ingredients: USP Grade Epsom Salts, sustainably sourced Dead Sea Salt, sustainably sourced Pink Himalayan Salt, Non-GMO Grapeseed Oil, Organic Jojoba Seed Oil, Sweet Almond Oil, Sunflower Seed Oil, Mixed Tocopherols, Non-GMO Corn Starch, Hemp Extract, Bergamot, Organic Lavender, Wintergreen, a proprietary blend of essential oils for fragrance. The synergistic combination of essential oils, organic carrier oils, and hemp-derived CBD extract in Empower® Topical Relief Lotion soothes discomfort*, refreshes and moisturizes the skin, and helps invigorate the body. * Every batch is 3rd party lab-tested for superior quality and potency. Hemp Derived Cannabinoid Content: 175mg** CBD per 50mL bottle. Dispensing Type: Pump Bottle. This product can be conveniently carried and quickly and easily applied. Empower Hemp products are infused with CBD derived from organically grown hemp and are 100% THC-free. **Target cannabinoid content; see packaging for exact CBD content.